As always start the drawing from the construction. Use simple geometrical forms to ease the task (in case of the video it’s a cropped pyramid). To show the metal surface give special attention to the shades, half-shades, reflected light and highlights. This requires careful attention to small details. Make several sketches using different metal objects, glossy metal, brushed metal etc. All these principles also apply to other types of surfaces such as plastic, wood etc. 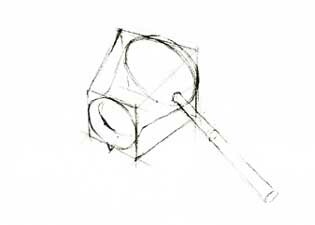 Start drawing the object by constructing the containing simple shapes. 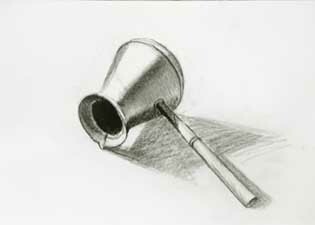 The completed metal object drawing from the video.